Nestled in the emerald green Los Nevados mountain range sits this gem of a retreat. La Serrana is planted in Colombia’s world famous Eje Cafetero in Quindio, where we offer the ultimate affordable and authentic Colombian hacienda experience. Our 20 hectare farm of green pastures has 360 degree views of rolling mountains and valleys. We offer horse riding, mountain biking, spanish classes, relax massage, rock climbing, coffee tours at a local plantation, proximity to the breathtaking Valle de Cocora trek, and easy, walkable access to the real Colombian cowboy town of Salento. 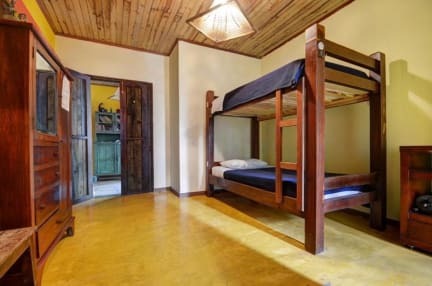 Our Colombian styled Hacienda, complete with antiques, consists of three dormitories with exceptionally comfortable bunk beds, and several private rooms which sleep up to five people, all with ensuite bathrooms and hot water. All our rooms include a free breakfast and are very reasonably priced. We have two dining tables, and a large lounge area with a wide selection of DVDs and plenty of comfortable couches and sitting areas for whiling away the hours in good conversation. Wonderful hostel, a little outside of Salento, but only 5min with the Jeeptaxi for 6000 Pesos. Beautiful area to relax. Breakfast was good too, eggs included and you had to pay for extras. Our last two days they didn't have any fruit juices though and no extras anymore, maybe because we came at 9:45, but breakfast is supposed to go until 10. We really enjoyed the stay, we had a private room for 3 people in a different house than the main house. Highly recommend! Best Hostel ever! Everything was perfect. Das Hostel ist super schön gelegen und auch noch fußläufig zur Stadt. Der öffentliche Bereich ist super schön mit verschiedenen Sitzmöglichkeiten draußen und Lagerfeuer am Abend und im Haupthaus gibt es gemütliche Sofas und tvs. Das Personal ruft Taxis oder hilft bei der Organisation der Touren. Bett war gemütlich, auch wenn das Zimmer etwas feucht wirkte, aber man ist eben auf einem alten Gutshof. I love this hostel. Breakfast is the best. The view is amazing! Sehr ausgelegene Betten in muffigem Zimmer ohne viel Tageslicht, ein kleines Fenster ist lediglich im Bad. Wasser kommt nicht besonders stark aus der Dusche. Frühstück beinhaltet Brötchen, Ei, Banane und Kaffee. Obst, Granola etc. muss ma extra zahlen. Sehr liebes Personal, das allerdings ab 7 laut ist. Zimmer relativ groß mit großen Schließfächern. Viel Platz im Gemeinschaftsbereich. Family Dinner! Jeep aus dem Dorf für 6000 COP. We stayed in one of the “glamping” tents, which we didn’t expect at all, because I booked a private room via the website. The tent itself was pretty old, with holes and the front side didn’t shut so that we had to use a safety pin. Also, we were missing a mosquito net, which we luckily had with us. It also came as a surprise that only cold showers were available. 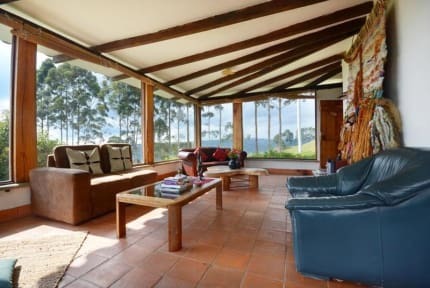 On the bright side, the location is cool for visiting the coffee farms and you have a stunning view over the area. I stayed for two nights and cannot recommend this place. My room was super dark, moldy, tiny and packed. There was not enough space for all the people, who stayed in there. The staff didn’t give me a proper introduction about the place and was also not very helpful with giving advise, planning tours or routes. Breakfast is a tiny portion of egg and a mini-bread. The atmosphere of the hostel is rather uncomfortable. People were hanging in different corners and checking their phones.